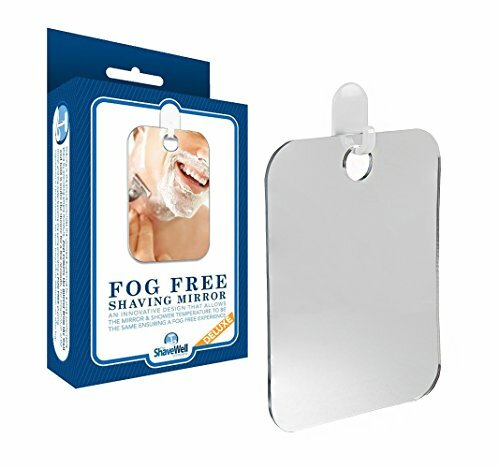 To get a truly fog-free reflection with your Shave Well mirror, hold it under the shower stream for a few seconds to "warm it up" right before you shave. The Deluxe Shave Well Mirror measures 6.83" tall, 5.25" wide and is 1/8" thick. The base of the adhesive hook (the part that sticks to the wall) is 1" x 1 1/2"
It works on basic science - Hold the mirror under shower stream where temperature of the shower and mirror will equalize for a long lasting, fog free reflection. Easy to clean - Wet mirror and clean with a pea-sized drop of toothpaste to keep spots away. It will look like new after years of use. The Deluxe Shave Well Mirror measures 6.83" tall, 5.25" wide and is 1/8" thick. The base of the adhesive hook is 1" x 1.5". If you have any questions about this product by The Shave Well Company, contact us by completing and submitting the form below. If you are looking for a specif part number, please include it with your message.